I’ve been struggling with a sinus infection for the last couple of weeks. (as soon as the Chicago Teachers Union strike was over – BAM – I got sick! It’s been rough….) I’ve barely been able to keep up with the kids and my job, let alone make any progress on crafty things or update the blog. Hopefully, I’m on the mend – with the help of antibiotics – and will be able to balance everything a little better going forward. Crafty updates: I *finally* got those NINE rosepath towels off of the loom. Yay! 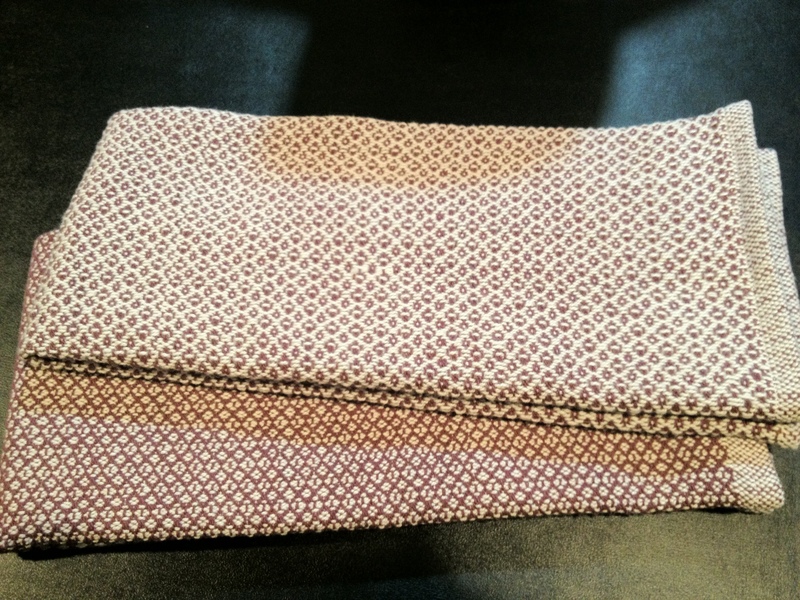 I’ve only hemmed three of them, and several of them have mistakes (one is quite a bit shorter than the others…. whoops!) But for a new-ish weaver, I’m very pleased with them. 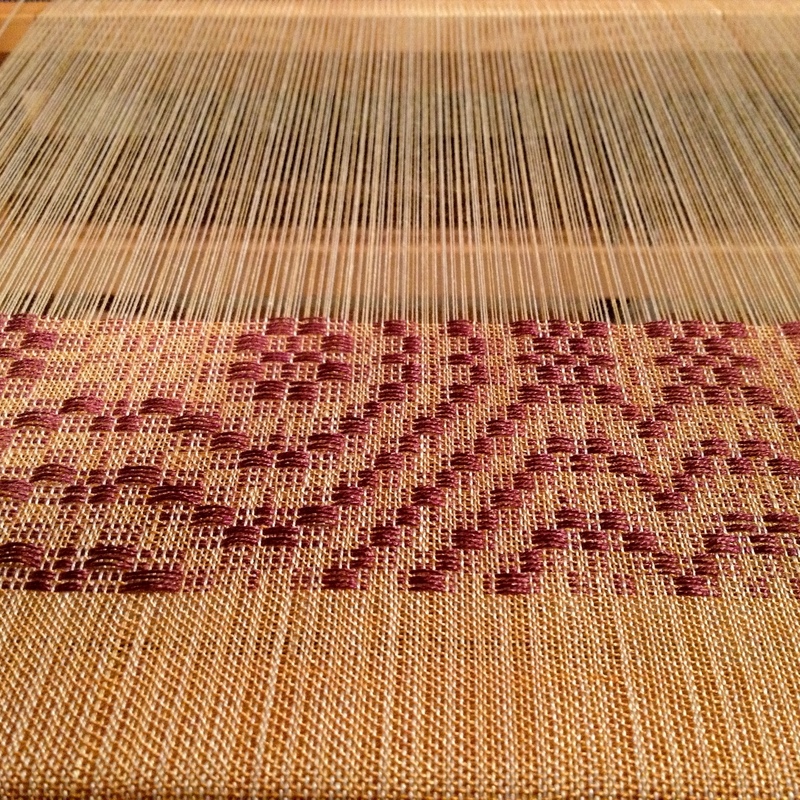 I also spent some time last weekend warping the loom for a table runner that I’m planning to give as a wedding gift. It’s overshot, which is a weave structure I totally didn’t understand when I was reading about it. I finally got started last night and BOY is it addictive and magic to see the pattern emerge! I think I’m going to make really fast progress on this one. I find it hard to stop once I get going. Finally, I’ve committed to sewing my 5 year old daughter’s halloween costume. She’s currently obsessed with My Little Pony and wants to be Princess Celestia. I found a wonderful tutorial for making a Rainbow Dash costume at the awesome blog Craftiness is not Optional. Stinkin’ cute, isn’t it??? I’m going to modify this (using white fleece and different colored yarns for the mane and tail) to create a Princess Celestia costume. One main modification will be to somehow add a unicorn horn…. if you are reading this and have any ideas, please post in the comments!! !